In my adolescent years I was writing scripts and directing plays in school and summer camp. I thought the theatre would be my life, as it was for my eldest cousin and mentor Jean. But I could never stay in one place. Jean could never leave her’s - New York, New York. A futurist and innovator, Jean Rosenthal lit the American stage with the genius of her craft and the magic of her art. Inspired by the paintings of Rembrandt and Monet, she mastered both the technical and poetic aspects of stage lighting. She used light’s form, color, and movement to express the intention of a performance. “Light is tactile to me,” she said. “It has shape and dimension.” Integrating light into the overall texture of a production, Jean’s mantra was: “the most successful and brilliant work a lighting designer can do is usually the least noticeable.” Theatrical lighting today has its origins in her pioneering work. During the Great Depression Jean apprenticed with John Houseman and Orson Welles at the Mercury Theater. Back then, the title ‘Lighting Designer’ did not exist. She had to invent it. The French boasted they conceived Sound & Light shows like the original at the Great Pyramid of Giza. Jean thought them unimaginative so she reinvented that medium for the Boscobel Restoration, the Hudson River house (now a museum) in Garrison, New York. Then owned by the Wallace family of Reader’s Digest, Jean wanted Boscobel to be the archetype for the other aristocratic Hudson River houses and surrounding land, rich in American history and the distinctive quality of light depicted in paintings of the Hudson River School. Employing actors Gary Merrill and Helen Hayes to perform the narration, Jean’s innovative lighting techniques brought to life the historical significance of the place and times. The majesty of the river, the seamen of the Half Moon who sailed it, the Dutch settlers who farmed the land, the war over the land, West Point canon firing from the opposite side, the noble mansion itself and the people who lived in it. Working long hours from cramped quarters in the bowels of the former Empire Theatre on Broadway and 41st Street, Jean always found time for little me. There were free tickets at the box office for all her productions, free makeup kits for my school plays. I was the only kid in my class who got to see Maria Tallchief in the George Balanchine production of Igor Stravinsky’s Firebird Suite — center orchestra, seventh row on the aisle. It remains one of the most exciting live performances of my life. Another luxury was dining out. Though she was a gourmet cook, Jean conceded to my teenage cravings for lunch at Schrafft’s Restaurant or the Horn and Hardart Automat. BLT’s and strawberry ice cream sodas at Schrafft’s were special. But it was a lot more fun to put coins into those slots at the Automat, watch the little door open, and have delicious chocolate pudding miraculously appear. For nostalgic New Yorkers those life and times are extinct but not forgotten. By the time Jean was in her early forties she had hundreds of Broadway shows, operas and New York City Ballet productions to her credit. 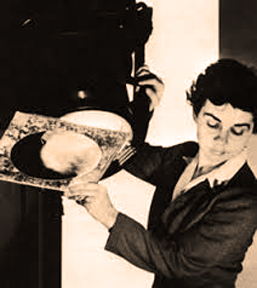 With her ground-breaking lighting techniques and fresh artistic style she influenced all forms of theater in the U.S. and Europe. At her most creative when lighting the dancer, Jean maintained a lifelong association with Martha Graham’s company. Early on, when Orson Welles asked Jean to come with him to Hollywood to produce Citizen Kane, she had to make “the toughest decision of my life.” Years later at a family gathering, she confessed how difficult it had been to say ‘no’ to Orson. Creating to the beat of her own heart, Jean lit up the skies over Broadway and beyond. Russian-American choreographer George Balanchine controlled everything and every one, including his collection of dancers—the three he married: Vera Zorina, Maria Tallchief, Tanaquil LeClerq. And the one he didn’t, Suzanne Farrell. But Balanchine’s Four Temperaments opened and flopped because of overly elaborate European backdrops that Jean said were “clunky, outdated.” She rescued the production for the New York City company with her less is more blue cyclorama and unique lighting design. An instant success, Four Temperaments remains part of the New York City Ballet repertoire. Until his death, Balanchine never did another production without her. While Eugene O’Neill, Thornton Wilder, Tennessee Williams, Arthur Miller were transforming twentieth century drama for the stage, Jean was revolutionizing lighting design. Today’s theatrical and architectural lighting have evolved from her original plots, control boards and cues. Many of her original drafts are referred to today. Her plots have been adapted to evolving digital technology, but her original concepts and cue placements are extant: Plaza Suite, directed by a young Mike Nichols, West Side Story, The Sound of Music, Barefoot in the Park, Judy Garland At The Palace, John Gielgud’s Hamlet, Fiddler on the Roof, Cabaret—over 300 productions carry the original credit line, "Lighting by Jean Rosenthal." I still don’t know a Fresnel lens from a klieg lamp. The technical aspects of some of Jean’s focus charts for Hello Dolly look to me like quantum mechanics. A technician as well as a designer, Jean created magic with her subtle use of gels along with light and the absence of light. Using deep color washes of back and side light, she surrounded performers with lighting that rendered them jewel-like. Many of her complex hook-up charts, cue sheets and lighting plots are preserved at the Wisconsin Historical Society in the archives of the University of Wisconsin, and the research archives of Lincoln Center, New York. Jean was only 57 years old when she lay in her hospital bed. Too sick and weak to hold a pen, she dictated her forthcoming book into a recorder. I was working at our embassy in Japan and could not be with her. But I wrote her about my encounter with Igor Stravinsky who was on tour and a guest at the home of our Ambassador in Tokyo. Barely coherent when I shook Stravinsky’s hand, I blurted out, “Hi, I’m Jean Rosenthal’s cousin.” Embarrassed, I wanted to shrink behind the nearest silk screen. But the maestro threw his arms around me in the mother of all bear hugs. I couldn’t breathe. “Ah my leetle Jeenie,” he bellowed, squeezing the life out of me. “I luff her. She is ze light of my Firebird’s life!” I like to think his comments gave her a good chuckle. Would lighting design have progressed if Jean had gone with Orson Welles to Hollywood? I think today’s award-winning artists like Natasha Katz and Donald Holder would say yes. I would add: Whereas designers of Jean’s generation focused on the art, she was akin to the old Dutch masters who experimented with light and left us their genius for technique. Her book, The Magic of Light, The Craft and Career of Jean Rosenthal became the lighting design student’s bible. Jean did atmosphere. With awe and gratitude to those who went before and those who follow—the genius and passion that gives rise to art, begets art.